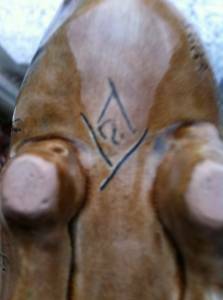 My name is Anthony L. Hayes and I’m a self-taught artist from Fairdale, Kentucky having never gone to school for pottery. Having never touched clay until January 15th, 2006, when I did I found what I wanted to do for the rest of my life. As a child growing up outdoors in the country, I was involved in hunting, fishing, frogging and snake chasing. These experiences are reflected in my work. Over the years, I have developed an appreciation for antiques and stoneware. It is this appreciation that motivates me to turn clay into something I’ve already loved. Folk potters J.H. Miller, B B Craig, and Anna Pottery have given me the inspiration and desire to create the type of pottery that I do, with my own special touch. I hope to leave a legacy through my own work for other people to gather up one day. 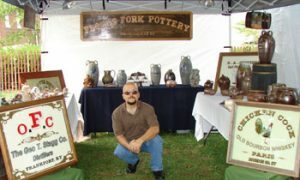 If folk-art pottery aficionados chose a Rookie of the Year, Anthony Hayes of Bullitt County might walk away with the prize. The 41-year-old former sign painter – owner of Anthony’s Towing Service – has created more than 600 pieces of folk-art pottery in his first year at the wheel, and most of it was sold even before it was wood-fired in the kiln at his studio, Floyds Fork Pottery. Hayes’ distinctive pieces are wrapped in snakes, mice, frogs, faces and human forms. 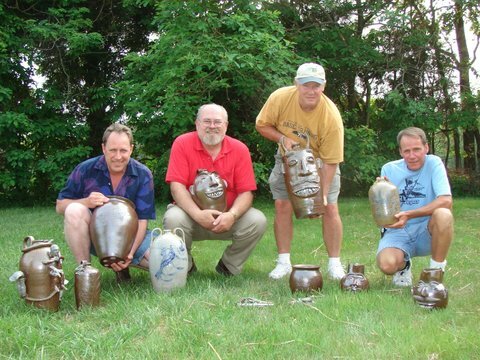 Some are reminiscent of traditional 19th-century styles such as the “pottery pig” advertising whiskey bottle, or stone whiskey jugs with caricatures of human figures clinging to the sides, their arms clutching the neck. 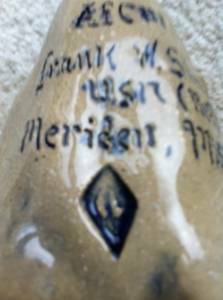 Jerry McKin ley, a prominent collector from Shelbyville who buys from coast to coast, judged the quality of Hayes’ work to be as good as or better than a number of the most popular Southern folk-potters of both the past and present. “As time goes on it’s going to be real, real interesting,” said McKin ley, who disclosed that some of Hayes’ earliest works already have surpassed prices of $1,000 on the collector market. The heart of Hayes’ art, however, lies not so much in its dollar value as in the artist’s wish to leave some keepsakes of his own creation in the gallery of folk-art potters whose work he has treasured as a longtime collector. 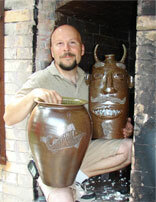 Hayes – who draws much of his inspiration from 19th century Kentucky/Indiana folk-potter J.H. Miller and Mississippian George Edgar Ohr – may prove an exception. Hayes now has a better understanding of why Ohr came to be known as “The Mad Potter of Biloxi,” for his frequent refusal to give up a commissioned work when the collector came to take delivery.